I’d like to thank Stephanie and Ryan over at Hedger’s Abroad for their blog love! 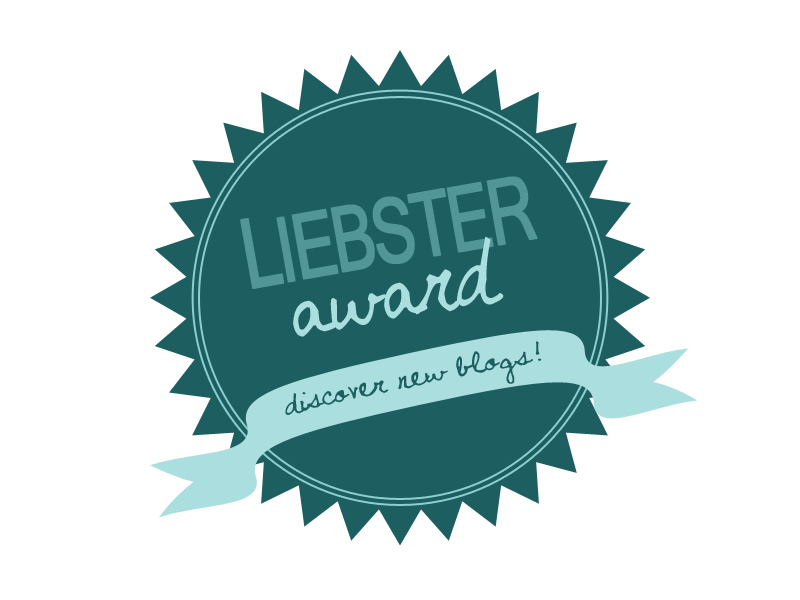 They have nominated me for the Liebster Award – an award for the blogging community, by the blogging community. I just got back from breakfast – today we went across the road from school and visited a local khao gaeng (literally translates to rice curry) shop where you can choose pre-prepared meals to have over rice. I had a chicken massaman curry which is a bit extravagant for me for first thing in the morning. Usually I would have some vegetables and meat, or maybe nothing… Anyway, I saw the coconut, peanut and potato curry and just had to have it. So yummy. Do you ever get bored with blogging? Why or why not? I sometimes worry that other people get bored with my blogging!! I don’t get bored, but I do sometimes run out of things to say. I’d rather just take a break from blogging than post for the sake of it; then it becomes a chore. I’m a bit of a secret worrier (not warrior!) and sometimes I stress myself out about silly little things. Sometimes I wish I could remove that aspect of myself so that I could get on with doing more things for myself and not over-worrying about other people. Not that I would like to be a selfish person though! Where is one place you would never go and why? I’ve never really thought about where I wouldn’t like to go. What with being the kind of person that quits their career and moves to the other side of the world for an unknown amount of time…! I suppose I have never really fancied travelling around Australia but it’s not for any particular reason other than I can think of many other places I would rather go to where my money would go further and I would experience more cultural difference – I always like to get my money’s worth! Plenty of my friends have been (and some, never come back…) but for me it’s not somewhere on my wish list. Then again, neither is Kazakhstan but you never know do you? What seemingly insignificant thing drives you crazy? Rustling! Crisp packets, carrier bags, any kind of crinkly, plastic packaging. That sound makes me feel sick. It’s stupid, I am very aware of that! I have found myself shooting T the most evil looks if he is over-scrunching a snack. Hate it! What is one thing that you like, but your friends don’t? I’ve really had to think about this one – I’m friends with my friends because we have similar tastes in music, fashion, life etc. I’m not even unique fashion-wise with my love for things that are so awful they are good (think kittens on jumpers, big golden things, clashing patterns…) or my eclectic taste in music (AKA liking anything that makes my feet tap and my head nod). Actually, I don’t know any of my friends that enjoy a toasted cheese and peanut butter sandwich. There you go! If you could say one sentence to everyone around the world at once, what would you say? I’m guessing this question is in here to provide me with the space to write some over-referenced quotation from a great leader or worse, Marilyn Monroe. I’ve seen her misquoted talking about things that didn’t even exist when she was alive! I would just tell everyone to smile and try to be happy (or as happy as they can be) – but that’s easy for me to say; there are far more people around the world in a much worse situation that little old me. To be honest, I guess I look to different people for different influences. Of course, my Mum has been a big influence on me and we are very alike (in fact, identical when we’ve had a few vinos…) and growing up I looked up to various teachers and youth workers (and, surprise, surprise – I ended up being a youth worker myself and went on to be a teacher now). If I see something good in someone that I appreciate, I try to make sure that I pass on the goodness through my own behaviour. I am unashamedly becoming obsessed with checking out the reduced items in Tesco. I love getting a bargain, even living in the land of cheap living! I’m so lame! My mum will tell you that I also loved a bargain hunting trip to Asda when I lived at home. If the world were to end tomorrow, and you knew it, how would you spend your last day? I’m going to assume I can beam myself around the world back home otherwise I would probably be spending my last day flying back to the UK so I could see my family and friends! So, if I could be at home already, I would just spend the day at home with my family, eating all the food I like and having a Christmas day type affair of not doing much but being together. Oh, and if Asda was open I would totally go there because they would have a massive reduced items section if the world was ending. Time to pass on the blog love! TEFL and Louise – English teaching in various places! t & c: simple explorations – again, teaching in South Korea but this one is about to get extra interesting with the addition of a baby on the way! Posted on November 26, 2013 October 11, 2014 by cornishkyliePosted in Random thoughtsTagged blog award, blogging, liebster award. Loved reading your answers! I laughed at your toasted cheese and peanut butter comment. Ryan really loves peanut butter and mayonnaise sandwiches. So DISGUSTING!!! Mayonnaise is taking it to a level that even I would not go to! I’m also a compulsive bargain box hunter. Solidarity! That picture of Gwyneth Paltrow has been haunting me since you posted it. She really turned it on, didn’t she? So, when I needed to explain the word ‘award’ to a group of students the other day, I found myself imitating Gwyneth. All but one of the students looked at me in that strange/blank way I am becoming used to. The only one who seemed to get it was Thai. Maybe they watch the academy awards there too? Or maybe it is a totally normal way to react to accepting an award in Thailand – they do like to scream/cry/sob at the smallest things!! Okay. As long as they do it with a lot more style and don’t unhinge.